In the previous post we examined how the maxima model can be applied to the SP500 dataset using quarterly and monthly blocks. A more modern and comprehensive approach involves fitting an appropriate threshold model to the data rather than dividing the entire dataset into quarters or months. Before we can fit the model,we must determine the suitable threshold to use. This can be assessed by visual inspection of mean excess plots and/or gpd shape plots from the library. 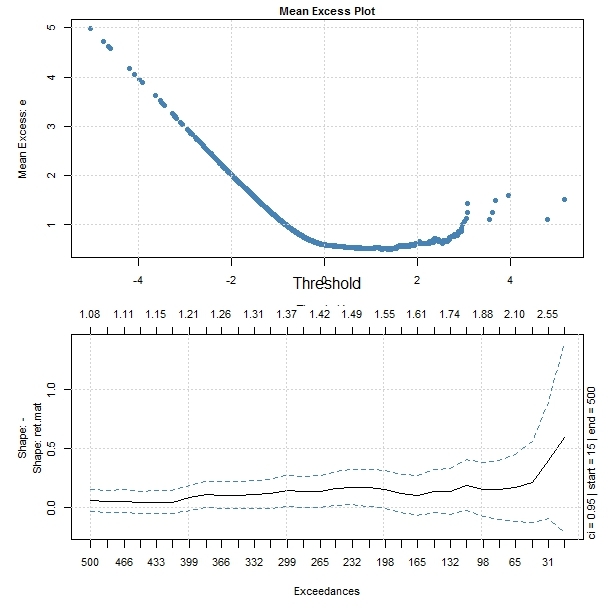 The mean excess plot becomes linear and upward sloping at around a threshold of u=1, which we can then use as an input to fitting the gpd model. Diagnostic plots suggest that the GPD model is quite suitable to modelling the returns data. 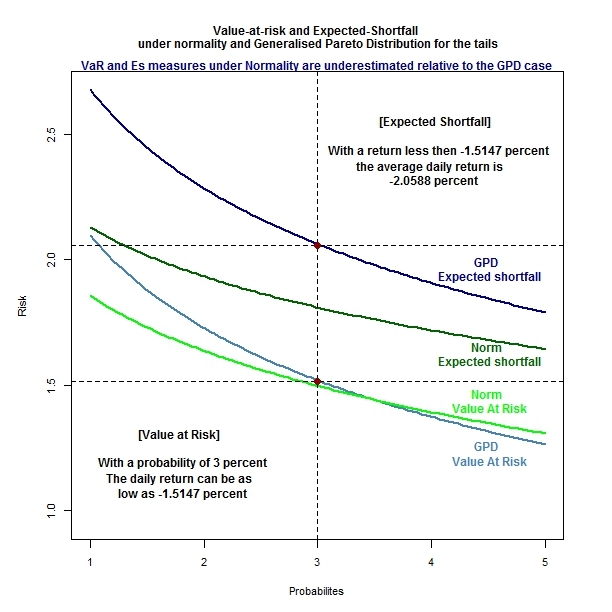 Now that we have fitted a threshold model to the SP500 returns data, we can use this GPD distribution to calculate extreme risk measures such as VaR and Expected shortfall. The following section compares these risk measures under a normality assumption versus the fitted GPD distribution. 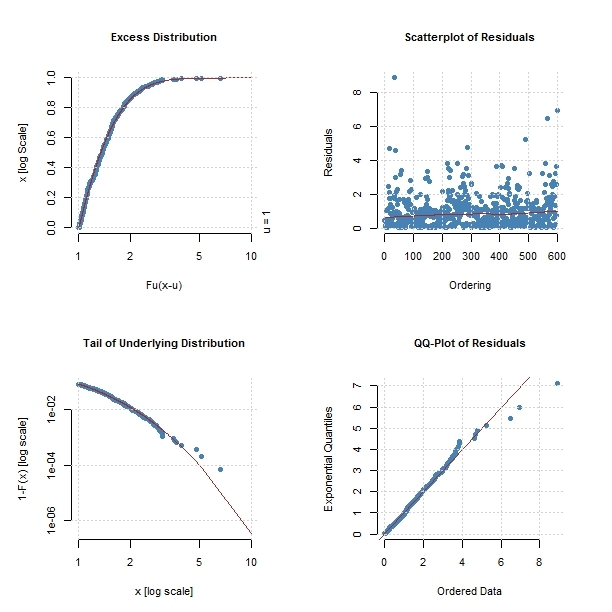 The following plot shows how VaR/ES measures vary across Distributions (Normal vs GPD) along probability levels. 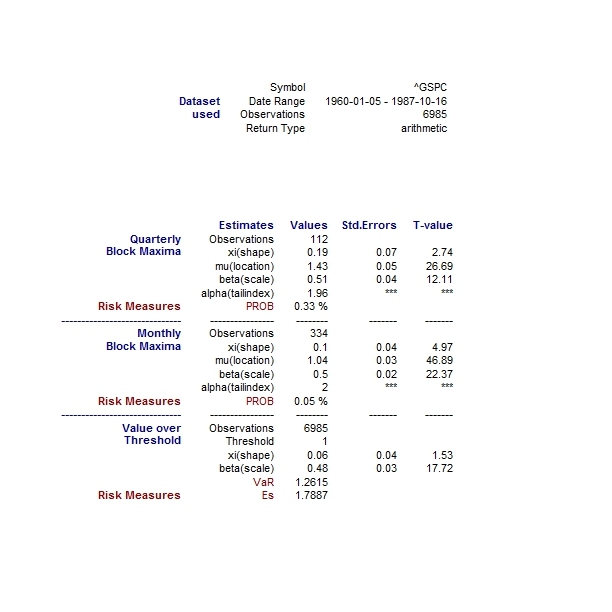 The results corroborate the intuition that extreme risk measures are underestimated in the case a normality assumption is imposed as opposed to the case where we use the more accurate GPD distribution to model the tails. Finally I have summarised the findings in the following table.